To sum up the problem of searching for exoplanets in one phrase, you could say “Dark plants and bright stars”. To elaborate, in our own solar system, the sun is 20 billion times brighter than even the largest planet, Jupiter. Looking for exoplanets is like looking for a bug near an extremely bright light bulb; and it is not easy. This is why scientists must use indirect methods to locate exoplanets. The existence of these planets are captured indirectly, using observed data. Much like trying to catch a criminal with no real proof, and only circumstantial evidence. Exoplanets react with their host stars in the same way, where each planet and host star revolve around a common center of gravity. In other words, when a planet orbits a star, that star visibly “wobbles” a small amount. 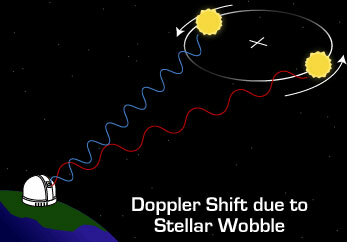 Using indirect proof, if this “wobble” can be detected, there is a good chance the planet exists. Unfortunately for scientists trying to detect exoplanets, this “wobble” is extremely small. Earth is also so far away from these stars that visibly capturing any effects is difficult. To solve this, an idea was developed using the Doppler Effect to detect any unusual patterns in distant star positions. The Doppler Effect is a phenomenon where waves (sound and light) appear to expand and contract as they become closer or farther away from an observer. For example, the sound of an ambulance siren changes as it comes toward someone, and races away. This is how the Doppler Effect works. If a star with an exoplanet appears to be wobbling, the wavelengths of light that reach the observer (Earth) will expand and contract as that star moves through space. If the expansions and contractions of these wavelengths can be observed, we know the star is periodically wobbling. This means that the observed star has a celestial body (an exoplanet) exerting gravitational forces upon it. This is an indirect method for discovering the planet’s existence, called the Radial Velocity Method, or Doppler Spectroscopy. Incidentally, because of a planet’s large gravitational force, the Doppler Effect is also very large. By observing the period of the expanding and contracting light wavelengths, the revolution cycle of the planet orbiting the star can be understood. By using the Radial Velocity Method, when new exoplanets are discovered, we also are able to predict their mass and orbit cycle. An exoplanet’s orbit can also be directly detected when the planet crosses in front of its host star. The light that reaches Earth from the star slightly dims. Just like viewing a solar eclipse of our own sun from Earth, this is a much smaller version. Due to this small “solar eclipse,” the amount of light captured from the host star periodically decreases, which proves the existence of an orbiting planet. This method is called the transit method. 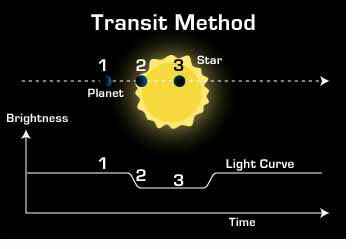 By using the transit method, an exoplanet is not only discovered, but additional information about the planet can also be calculated. When observing a transit, the decrease in the change of light can determine the size of the planet. For example, if the amount of light from the host star darkens by 1%, we know the planet’s size is 1% that of its host star. In these cases, it is possible to presume the planet’s size when exoplanets are discovered using the transit method. In addition, if a planet is discovered by the transit method and its speed is measured by radial velocity (1. Radial Velocity Method), we can assume the planet’s mass. Once the mass and size are both understood, the planet’s density can easily be calculated. In other words, by using these methods together, scientists can predict a lot about each planet they discover; whether it is rocky, has icebergs, is composed of gas, etc. When using the transit method, light that reaches Earth from the host star may also pass through the planet’s atmosphere. By analyzing this light, the planet’s atmospheric composition can also be predicted. Although this article doesn’t explain it in detail, in cases where the other side of the host star is hidden, using additional data (called a secondary eclipse), scientists can assume the planet’s surface temperature as well. The transit method is an extremely powerful tool. Not only does it prove that exoplanets do in fact exist, but it can give us detailed characteristics about each individual planet that is examined.